Perfect for passover or gluten free diet! 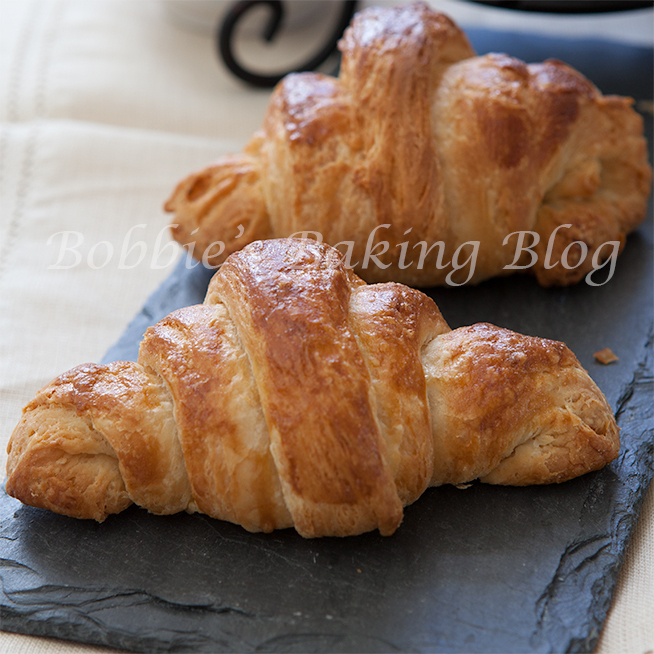 I adore a warm buttery flaky croissant with a strong cup of coffee. A friend, Nancy asked me if I could bake some gluten free croissants (she has celiac disease) I was hesitant, but she was persuasive. Sydney explained I should go out of my comfort zone and try to create a flaky gluten free croissant, the worst that could happened is the gluten free croissants would not turn out. I reminded Sydney I am a perfectionist and have a problem with failure, I become panicky. Sydney replied back the only way to learn anything new is to fail and learn from the mistakes. She also repeated my own words back to me, realizing ” mistakes is a trade off we have to embrace, and if you allow yourself to be open to mistakes, the faster you will learn from them, and the quicker you can grow”. I agreed to try and I tried about five times before I was satisfied the gluten free recipe tasted similar to the croissants with regular flour. I although stayed up all night on third attempt, due to being neurotic about my previous mistakes (that attempt failed too)! 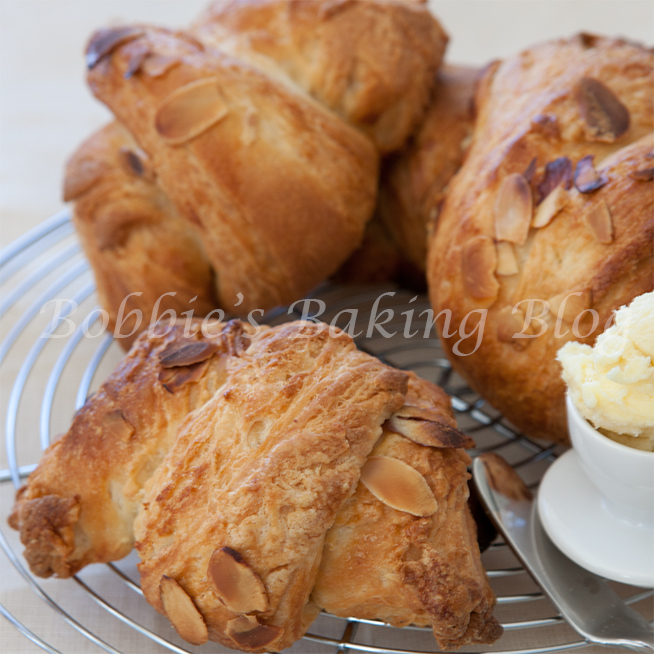 I also prepare a batch of almond croissants, gluten free! In a food processor pulse the sorghum flour, rice flour, and xanthan gum unit completely amalgamated, transfer to a bowl, and set aside covered. 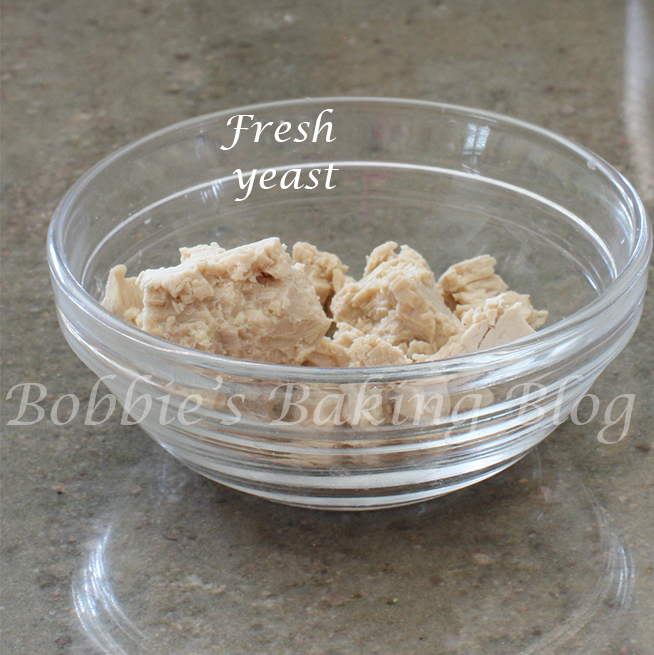 If using dry yeast: proof the yeast with the 110grams/ 1/2 cup warm cream, 4 grams/ 1-teaspoon sugar, and yeast. Adding the yeast to the warm cream and then the sugar allowing it to sit for about 7 minutes. b. Add crumbled Cake Yeast to sugar solution. c. Stir yeast until completely dissolved. d. Let mixture stand until yeast begins to foam vigorously (5 – 10 minutes). e. Add mixture to remaining ingredients. In the bowl of a standing mixer add the yeast mixture, the gluten free flour mixture (reserving 60 grams/ 1/2-cup flour if needed), and the brown sugar whisk together, by hand, and then whisk in salt. 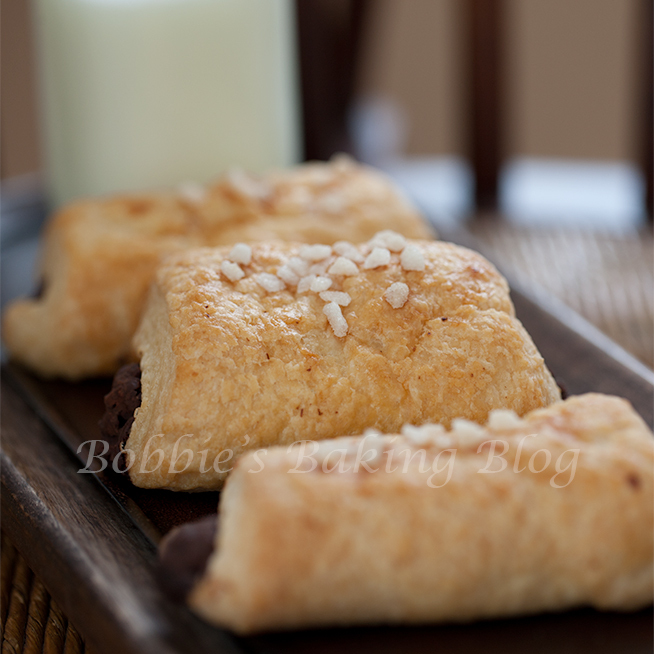 Using your dough hook on low speed add the warm milk until the dry ingredients are moistened. Raise the speed to medium (#4) and amalgamate for about 4 minutes. The dough should be silky, smooth, pulled away from the sides of the bowl, and will still cling to your fingers slightly. Place the dough in a 4-quart bowl 0r dough bucket that has been lightly greased with butter or cooking spray. Cover the bowl with the lid or plastic wrap. Place the dough in a r room temperature room (26 degrees C/80 degrees F ) for 30 minutes. If the room is colder preheat your oven to 150 degrees, turn it off, and the oven should register at 26 degrees C/ 80 degrees F. Place the dough in the oven. Cover and place in the refrigerator for at least 2 hours to 8 hours. Cube the butter into dice size pieces. I found the best way to combine the butter with the GF flour, is to place the cold cube butter and 25 grams of flour in the bowl of your standing mixer on low speed, with the paddle attachment, mix the butter and flour. Once the mixture is amalgamated shape into a 28cm x 28cm, 9×9-inch square (no thicker than 3/8 of inch). The butter should still be cool but workable- about 16 degrees C/ 60 degrees F.
Take the dough from the refrigerator and roll out to 31 x 31 cm/ 12.5 x 12.5 –inches. 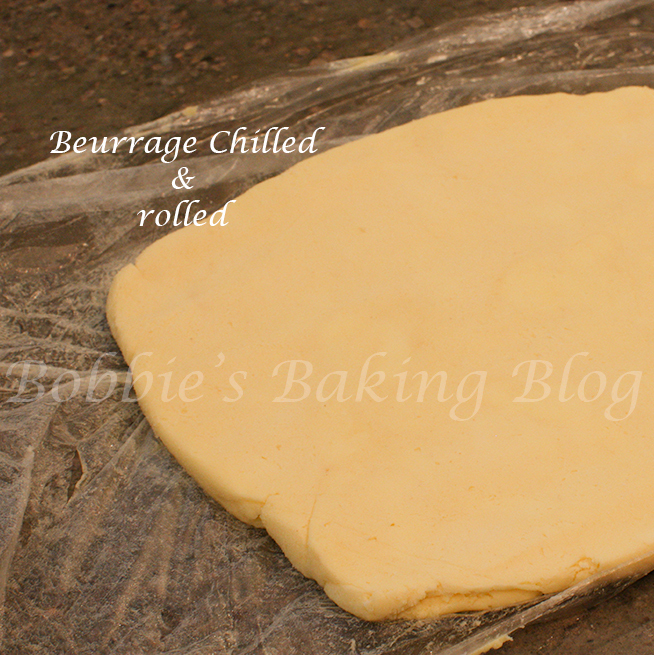 Place the barrage (butter square) diagonally in the center of détrempe (dough) using the back of knife mark the dough at the corners of the butter, remove the butter at form flaps where the marks are. Roll the flaps a little. Now moisten the flaps slightly place the butter back into the center, diagonally. Wrap the butter by securely overlapping the flaps slightly. Wrap the pâton in plastic film and allow it to rest in the refrigerator for 30 minutes, but no longer. ** The laminating method is one Rose Levy Beranbaum uses, I believe it works best. Place the dough seems side up on a floured marble board. Keep your worksurface lightly floured, gently roll the pâton into a long rectangle about 50 cm/20 inches long by 18 cm/ 7inches wide. 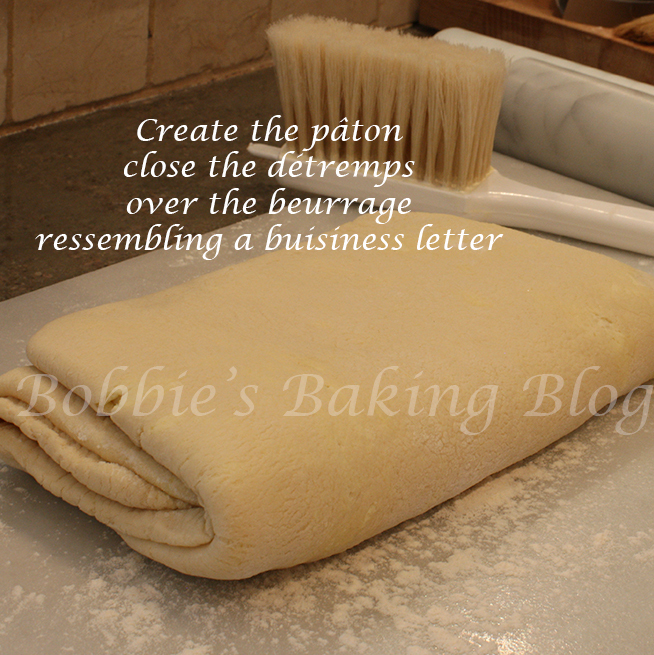 Brush off the flour from the dough’s surface and give it a business letter fold (folding into thirds). Wrap the folded dough in plastic film, lay on a parchment paper lined ½ baking sheet, and allow it to rest in the refrigerator for 40 minutes. Mark the paper to keep track of the turns. I generally like to complete a total of 6 turns, but a minimum of 4 turns is fine. 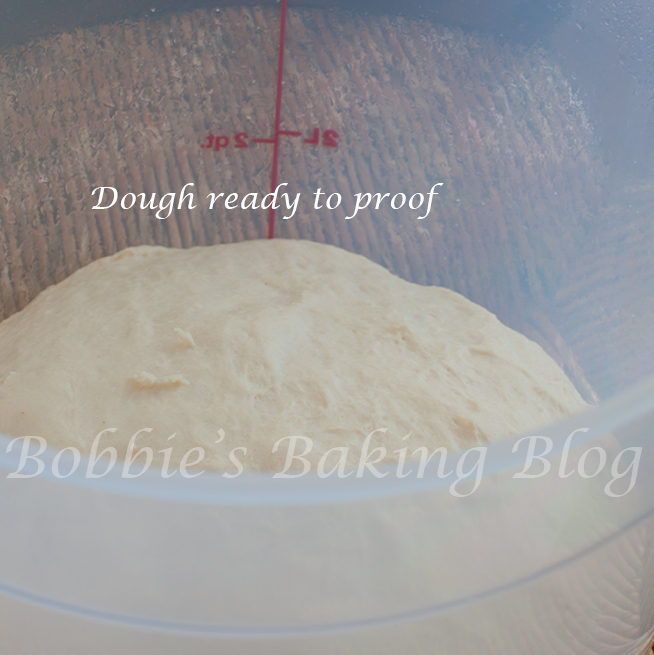 The dough will let you know! Start with a clean work surface that has been lightly floured. Position the dough so that the spine is faced to your left (like a book) and press down the edges of the dough with a rolling pin to keep them straight. (The upper part tends to roll out more than the bottom part). Roll and fold the détrempe the exact same way, but turn it over occasionally to keep the seams and edges even. 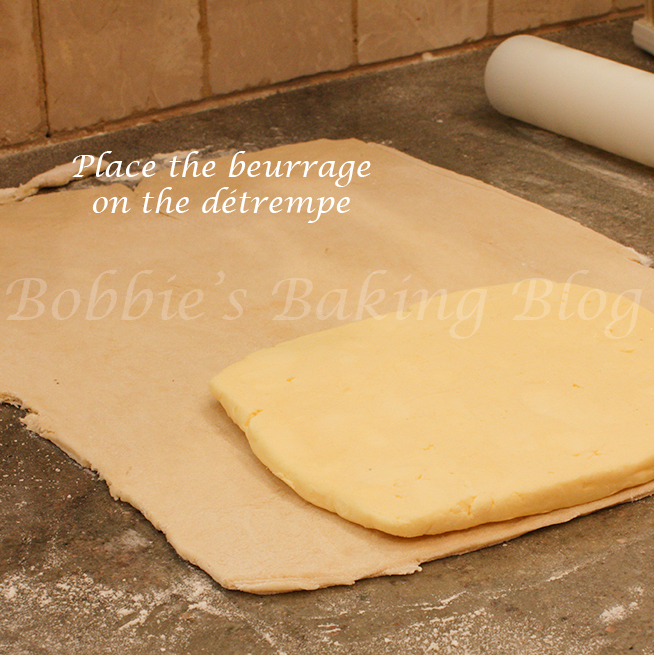 Be sure to roll into all four corners of the détrempe, and use a pastry scraper to even the edges. A total of four turns should be completed; the third turn can have a double fold equaling four turns. Begin with a cleaned flour workspace. 2. Unfold the triangle carefully, cut along the fold to separate. 3. Gently stretch the triangle twice it’s original length about 23 cm/ 9-inches long. 4. 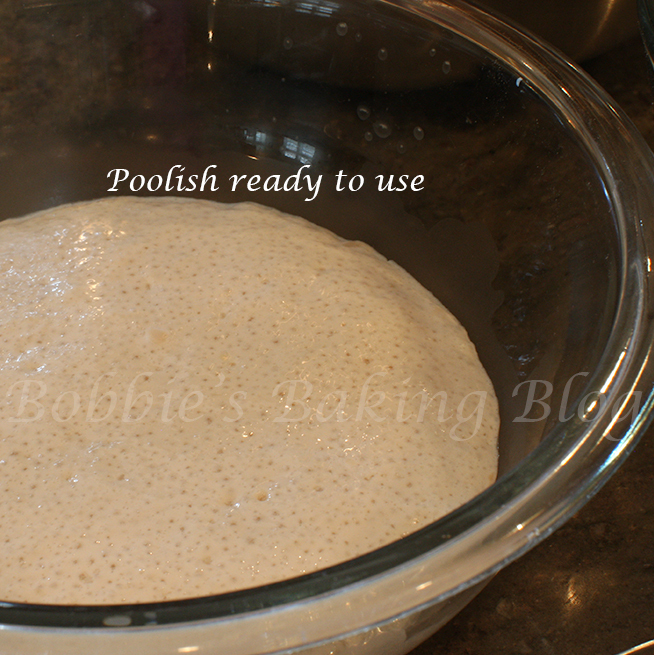 Enclose a piece of scrape dough to pump up the middle. 5. 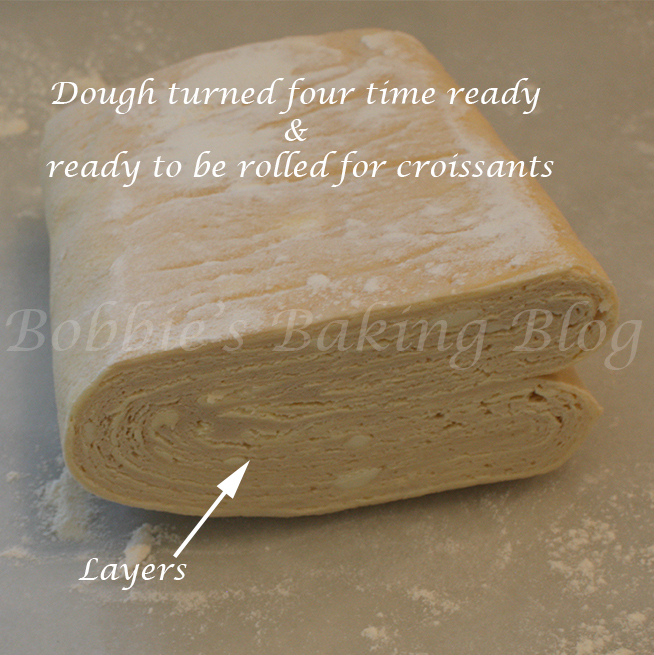 With the point facing you roll the dough towards you, gently moving your hand down out to the side. 6. Curve the pointed ends of the rolled croissant to form the traditional shape. Preheat the oven to 218 to 232 degrees C/ 425 degrees F, arrange the oven racks so one rack to the lower and upper positions. Prepare the egg wash and very lightly with a pastry brush, brush the egg wash onto the croissants. Open the oven, spritz the oven generously with spray bottle of water and quickly close the door. 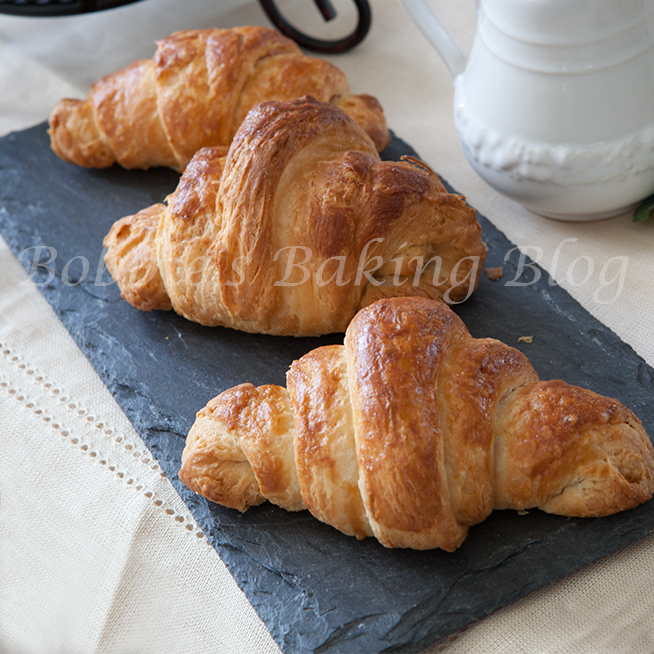 Open the oven door again, slide the croissant sheets into oven and re spritz. 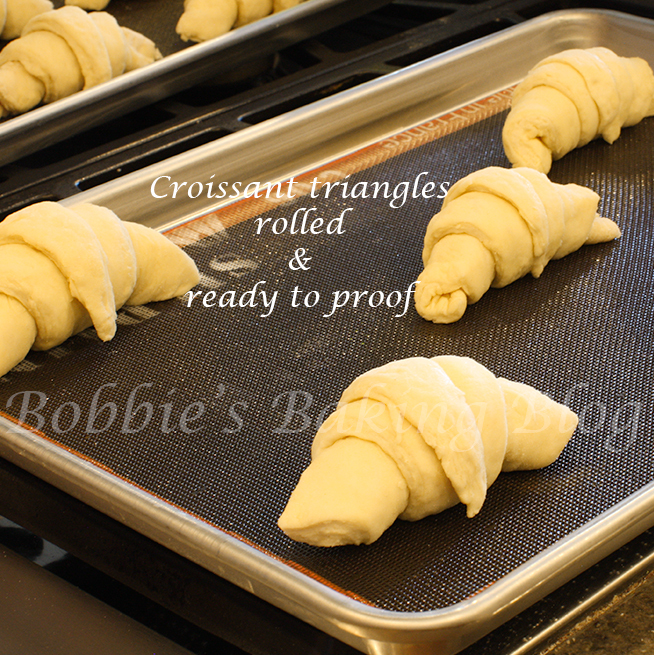 Turn down the oven temperature to 240 degrees C/ 400 degrees F. after about 10 minutes rotate the croissant sheets. Reduce the oven temperature to 191 degrees C/ 375 degrees F and continue to bake the croissants till deep golden brown, internal temperature should register at 99 degrees C/ 210 degrees F. (about 8 more minutes). They will finish baking while they cool. Once the croissants have achieved the color and correct internal temperature, remove from the oven and transfer to a cooling rack for about 20 to 30 minutes. Stepping out of my comfort zone gave me an opportunity to fail and realize the world did not stop turning. I also, in the end was able to create a gluten free croissant for Nancy. I owe Sydney a large thank you for being able to see the bigger picture, and nudging me to try. Sydney graciously FaceTime with throughout the entire attempts, excluding staying up all night with me! By the way I baked another batch with almonds, mostly to prove to myself it wasn’t good luck on the fifth try! While preparing the gluten free croissants I thought this would be a great project for you and your children, they can help with the rolling! Try gluten free Pain à Chocolate! Never would I have imagined that a gluten free croissant could look so good! And to taste similar to the real thing is simply amazing. I’ve been debating a gluten free diet but am hesitant to give up so many treats that I love. This might help convince me! Thank you, try the recipe and let me know what you think! Is there a recipe the picture of……the try gluten free pain a chocolate …..I’m so excited for ur site…..have ha skin issues for 24 years it them about 6 years in with all the dr.s and tests to finally diagnose me with psoriasis…..in June of 2012 I saw a dr…and have changed my diet gluten free and dairy free….my life changed….have learned so much….but really miss my bread….. The recipe for the Pain à Chocolate is the same gluten free croissant dough, cut rectangles roll and place a bâton of chocolate, roll one more turn, place another bâton a finish rolling. Proof & bake. They look delicious. My skill level is minimal but by following your tutorial I truly think I could make these. I do have a question though – when you say “Enclose a piece of scrape dough to pump up the middle” do you mean to roll the croissant around a piece of scrap dough? If so, how large – and was it grape size or rolled out like a worm? Thank you, Susan, you want a large pea size, roll the croissant triangle about 2 rolls and add the the little pea size dough, than continue to roll. If you have any more question please don’t hesitate. Gluten free be able to enjoy these! Thanks for sharing I love food! I a glad i could help! Looks so delicious! I can’t wait to try them! 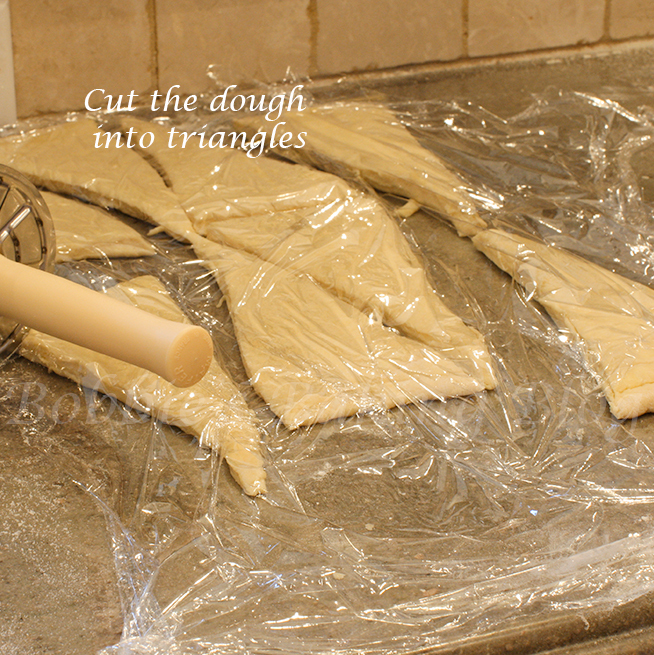 After the dough is ready do you roll it out before cutting the triangles? These look delicious! I’ve been trying to build up the courage to try my hand at gluten-free croissants. I just have one question. I’ve never heard of sweet brown rice flour before. Is this similar to sweet rice flour (glutinous rice flour) or is it more similar to regular brown rice flour? Thanks! Emily, sweet brown rice flour is sweeter than brown rice flour other than the flavor any rice flour will work.Please let me know how the croissants work out for you. These Croissants looks so good! You are so sweet, Vera! I have searched all over the web looking for gluten free croissants; thank you. I have already made a batch and the instructions were perfect. I can’t have dairy, do you think I could sub coconut milk for the milk and cream? And either coconut butter or earth balance in place of the butter? Andrea, I have not tried baking croissants with out dairy, but if you give me a three to four days I would happy to try. These look fantastic and the recipe sounds great. I am looking forward to trying them. They just look so amazing, I’ve never seen gluten-free pastry like that! Hi! These look great, being gluten free these look fantastic, I did want to say however, that they are by NO means Kosher for Passover. Yeast is quite a prominent ingredient here, and the main factor in keeping Kosher for Passover is a lack of yeast. Just thought I’d put that out there. Hi Laurie, I did consult a reformed Rabbi, before I wrote the post. How long did you proof them before baking??? Did u ever try the dairy-free version mentioned above? Sara, thank you, I have not used the dairy free recipe given by a member. I cannot wait to try this! I spent 2 days trying my hand at gluten free croissants myself, with no results! In fact the failures made for quite a post. Is there any specific brand of flours you prefer? Also, your photos say these proof, but there is no rise time for the fully shaped croissants. Do they proof once more before entering the steamy oven? 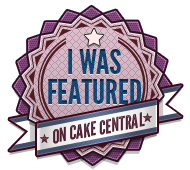 Thank you for such an impressive feat in the celiac community! King Arthur GF is my brand of choice. They proof until double in size. Someone posted this on pintrest and stated it could be used at Passover. I’m glad I followed it all the way back to it’s source. It’s not kosher for Passover, and near as I can tell, you – the creator of the recipe, never claimed such. I hope no one was duped. Still, they look amazing! I just wish they were vegan as well. These look amazing! I’m excited to try. But how many croissants does this recipe make?? Thank you Sasha..Generally the dough will yield 20 croissants! Thank you soooooo much for this recipe. I’ve always loved making croissants for my wife and she has been diagnosed with celiac disease. I’ve been having such trouble with pie crust that I assumed that croissants were out of our lives entirely. These look so yummy! I’m going to surprise her with some croissants this weekend! Merci milles mercis! My 21-year-old son just had his first (gluten-free) croissant! Hurray! Thank you so much for developing this delicious recipe. I am wondering whether the recipe would work as well with 1/3 or 1/2 less butter, and cannot tell from the many recipes I am reading. Because of the lower rise than with regular croissants, the butter kapow! is a bit more apparent. Again, many thanks. SO delicious! I’m working right now on this recipe. So exciting to try a GF croissant. While scaling the dry ingredients it gets my attention the recipe calls for 1/3 cup cornstarch and you indicate it equals 120grams- which seems too much for 1/3 cup. can you please clarify? also your original recipe was written in grams or cups? are you using 160g / cup of flour as a standard conversion? Hi Marco, All my recipes are in grams and than converted to common measure ments. I used 120 gran rice starch, however you can use 42 grams/ equal 1/3 cup cornstarch. Sorry for the confusion. Hi Marco, All my recipes are in grams and than converted to common measurements. I used 120 gran rice starch, however you can use 42 grams/ equal 1/3 cup cornstarch. Sorry for the confusion. I love croissants. I wish I made them more often. These look delicious. The photos with the almonds sprinkled on top and the Pain à Chocolate are gluten free ( the croissants on the black plate are the AP flour croissants). My nephew has celiac disease and I developed the Gluten Free recipe for him several year ago. I have had a plethora of readers use the recipe with success and hydration has not been a problem. I hope this clarifies the article for you. I would appreciate if you use the recipe letting me know how it worked for you. This post deserves a hallelujah , they are beautiful and perfect! gold star for recipe and persistence… you’ve done us all a tremendous service. The idea of a pain au chocolat may just outweigh my nerves about taking this one on. You are brilliant. BTW..The texture was a big challenge, but it finally got there. Thanks! Just found this recipe it looks amazing! I have never made croissants before and I am also gf and DF. Have you gotten the chance to try a dairy free version? Also I think a video in the whole folding and marking and folding process would be really helpful! I am trying my best to vision it but still a little confused. SO excited to try this recipe!! I’ll be replacing the brown rice flour with superfine quinoa flour, probably lightly toasted. I’m really confused about the rice starch vs cornstarch amounts. Usually in my baked goods I used a combo of tapioca, corn & potato starches (in addition to the whole grain flours). My understanding with most starches & flours is that you can sub a different, like starch/flour at an equal weight. So 120 grams of rice starch could be replaced by 80 grams tapioca starch + 60 grams potato starch + 40 grams cornstarch. But you’re saying 120 grams rice starch or only 42 grams cornstarch, which is really confusing me!! Thanks in advance for the help! 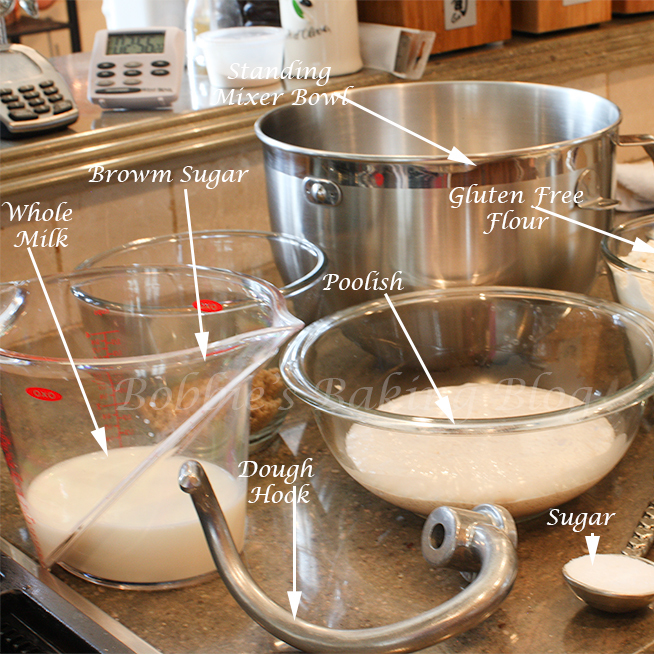 Oh, also – I don’t have a dough hook for my mixture – would it be ok to use the paddle?? Thanks! I haven’t figured out how to make rolling the dough with butter. what must I do after you put the butter on the dough square. Until the croissants double in size, about 2 hours. I live in LA and am gluten-free by necessity. I have been longing for GF croissants for some time now. If you ever sell them in Los Angeles or ship online, etc., pls let me know! I will be first in line to stock up. Thanks! I don’t understand direction #2- why is it folded? what have you done to the detremps after the final turn? How thin do you roll it? What size rectangle? What are the approximate dimensions of each triangle before stretching? The triangle cutter cuts 2 triangles, in order to have 2 separate triangles you cut on the fold. This step is only if you have a multi-triangle wheel. The GF mixture can be temperamental; you might want to try KA Gluten Free flour. They have develop one that works awesome! Hi am making these croissants today and wanted to know about proofing. After cutting the croissants and shaping them do you allow them to proof for a time? Or do you bake immediately? Also do you chill before baking after proofing? many recipes call for this and wanted to make sure I’m not missing something. Im really excited about these! Thanks so much for the recipe and for any info.